Discussion in 'Dice Influencing' started by pens1313, Jan 7, 2011. Has anyone had any problems with their dice hitting each other before they hit the table? Sometimes on my delivery the dice hit each other as they land and shoot out different directions. Is this more of a delivery issue or a grip issue? It could be a little of both. Exactly what grip are you using and how is your swing as you release the dice? I use the 3 finger front grip and was throwing really well for weeks i think my hand isnt flat at release and thats making the dice hit one another n bounce all over the place. It sounds like you are probably correct that your hand isn't level, but it sounds like the main problem is going to be you aren't letting the dice go evenly. When you grip the dice, make sure that you feel the split on the middle of your middle finger and the middle of your thumb. This is where you do all of the gripping. The other two fingers should touch the die faces, but not press into them. An uneven grip here will cause the looser gripped die to fly out in front of the tighter one (and if your hand isn't level it will make this worse). Just remember, only "grip" with one finger and the thumb. 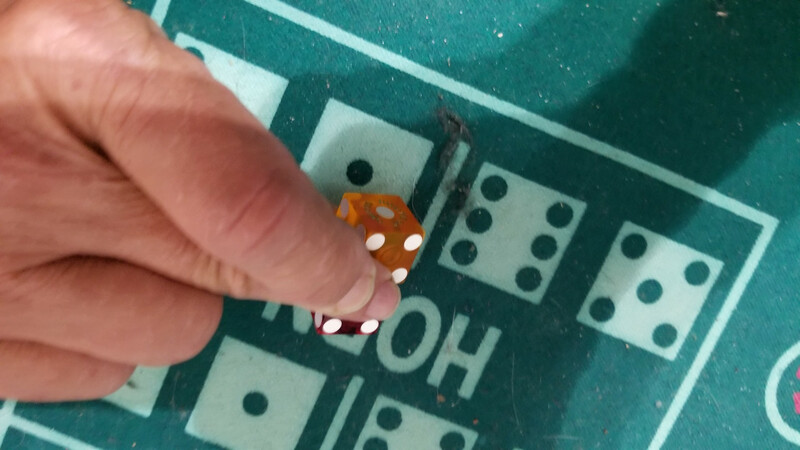 The other two are only there to let the dice get that nice roll (and if they are just touching and not trying to grip too, it shouk make for nice rolls). Until you get the level thing straightened out be feel, when you lift the dice back, watch where they are, make sure thay are level at the start and hold them there as you look to where you will throw. Pick a spot in line with where you have the dice waiting (pass-line, dont pass, wherever it works best for you). Sounds like you have the accuracy right but your mechanics are off a little.Three fingers over the dice would make them collide in mid air alot.I would practice more at home till you have proper control. You boys should buy the LIDs bestest selling book of the craps called "The Game of Craps." On page 755 the LID details with instruction and photo grips to use to avoid the smashing of the dices when tossing the dices. These include the most greatest Yuri grip and the Homeless Dave's two finger grip. If you boys are vertical I can give you onetime special offer of only $524 for book and $1050 for accompany DI skunkhat. Twelve4s, Mssthis1 and von duck like this. Take Barney's advice and study alternative grips and tosses. . Typical BS reply from Mssthis1, yes, just more deliberate attempt to CONFUSE the folks out there! Twelve4s, eagleeye2 and tabletop123 like this. Are using the typical 3 finger GTC or Parr shot.???? and even then I have never seen them hit in the air. on the 6's on the front of the dice. Make sure your level with the table top , very small back swing and go forward. Do not open your grip, just allow the dice to leave your hand. Pens, these dice are never going to hit each other in the air. He went on a two hour roll but I wouldn't bet on a random roller. But then again he must have been a DI that I never saw before! So the next time you see anybody using this shot you better bet on him! Let's hear it for the X shot, it must be a real money maker! That may be a strong grip if your fingers were long and slim. can see t he grip..
That "X" shot Looks Like a KILLER! The shooter apparently has to be double Jointed just to get the Set Up Right! That "X" shot looks like a ""KILLER SHOT""! Yes, one has to be Double Jointed just to get the Set Up Correct! Are you coming out of the closet about being a DI. Does this mean no more posting the ton of videos showing the dice bouncing all over. Well i guess the casinos are going be on high alert looking for this grip. Since they are constantly on here reading keeping up with the saga of TDB james and TDV. Just what makes you think ""casinos are going be on high alert looking for this grip. Since they are constantly on here reading keeping up with the saga of TDB james and TDV.""??? That what these guys are like, make a joke out of everything. what he has been seeing. Even when the original poster is long gone after seven years, for a moment there I thought Pens was Lid or Barney.